Although blinking is a reflex, we tend to blink less often when looking at a computer than when reading or performing other tasks. This causes our eyes to become dry and uncomfortable (and possibly blurred). In your work environment, blurred vision can be the result of something as simple as a dirty screen, poor viewing angle, reflected glare, or a poor quality or defective monitor. However, they can also result from more serious conditions like refractive errors (such as hyperopia, myopia, astigmatism), improper prescription lenses, presbyopia or other focusing disorders. What To Do: Glasses are the most likely solution to a blurred vision problem. They may be worn for distance viewing or for near viewing, depending on the findings of the eye examination. We offer computer glasses, which are high tech computer eyewear designed to protect, enhance and optimize your vision. Ask us how we can help your tired eyes feel much better! 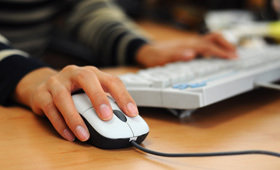 "Eyestrain" is a vague term that the eye doctors rarely use. It’s more than just "tired muscles", as our eye muscles are much stronger than they need to be. 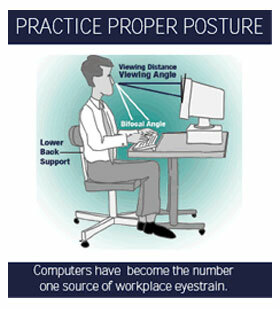 In the computer environment, eyestrain can also be caused by different environmental (and visual) conditions. What To Do: Eyestrain usually results from a combination of poor ergonomics, improper work habits or an undetected visual condition. A complete eye exam, an on-site ergonomic evaluation, and instruction on correct working habits should all be considered if this problem exists. CVS can be slow refocusing. When you focus on "close-up" objects (such as reading materials) for extended periods of time without taking breaks, your eye’s muscles begin to "adapt" to that range of vision. This stresses the muscles, which then have difficulty relaxing. When you look away, other objects may appear as a brief blurred image as you change from near-to-far or vice versa. Although this is most often a temporary condition, it can be an indication of a future vision problem – if it persists, consult your doctor. What To Do: Make sure you take adequate rest breaks. Eye doctors generally recommend flowing the 20/20 rule: every 20 minutes, take a 20 second break. During the breaks, make sure not to do the same kind of work you were doing before; that is, if you were copying information from a report, don’t take a break to read a magazine! Look far away if doing near work, and close-up if doing far work. Eye exercises can help to increase your ability to focus, but consult your doctor if you’re over 40. Nature’s made our visual system so dominant that we will often alter our body’s posture to accommodate any deficiency in the way we see. If our visual system isn’t seeing properly, we may assume awkward positions to compensate, which can lead to neck and back pain. Because we have two eyes, they must coordinate properly for us to see just one image instead of two. When the coordination system breaks down – as it can when you work at close distance for extended periods – people may experience double vision. Proper eyeglasses or therapy exercises can solve this problem. What To Do: Double vision can be the sign of a severe problem, so you should receive a complete eye exam. Modern monitors are full color, so this condition is rarely seen today. However, staring at the single color of a monochrome monitor for extended times can cause temporary color distortions following usage. Taking breaks will be helpful. What To Do: If at all possible, switch to a full color monitor and use black letters on a white background – the best combination for visual comfort.